It is so rare for me to find an Austen-related title with a wholly fresh tale to tell. This isn't a bland sequel to a Jane Austen novel, nor is it a spinoff appropriating her characters for its own purposes. It's a book that mixes genres while still presenting a tantalizing and well-paced story. 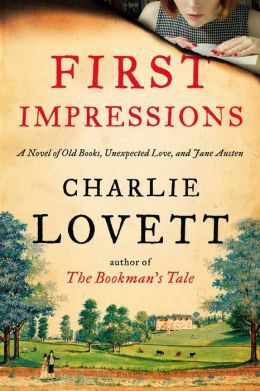 Lovett decided with this tale to devote each alternating chapter, never breaking that sequence, to first Jane Austen and then his modern-day Janeite heroine, Sophie Collingwood. Jane is in the beginning stages of a friendship with the elderly Reverend Mansfield that will be one of the defining (though entirely fictional) relationships of her life. Sophie is a devoted Janeite, freshly graduated from Oxford and unsure of which path to take to kickstart her adult life. Lovett doesn't portray Jane and Sophie all that differently, as both are young women at the start of their mature lives. If one takes away the incredible posthumous fame Austen has achieved, and of which she is, presumably, entirely unaware, we are left with a bare-bones Jane who rings very true. She was a female writer in the late 18th century, probably quite unsure what reception she would have in the wider world as a novelist. Sophie has grown up worshipping her Uncle Bertram, a discerning bibliophile and collector of old books. She is endowed with a passion for literature, but she has no concept of how to parlay that into a livelihood. At the heart of what develops as a central mystery, Sophie comes across a small, published version of a pre-PRIDE AND PREJUDICE First Impressions, seemingly authored by Jane's close friend Mansfield. Sophie's quest becomes proving Austen was no plagiarist. Every character, regardless of their level of participation in the narrative, is fully realized. Sophie's budding love interest, Eric Hall, is a total person in his own right. Her adversaries, Jane's supporters, all felt necessary at every point in the novel where Lovett placed them. I sped through the story, anxious to see whether Sophie could in fact redeem her (and our) idol, or if the truth damned her beyond rescue. The novel was satisfying in its conclusion, though, as Jane said, "If a book is well-written, I always find it too short."